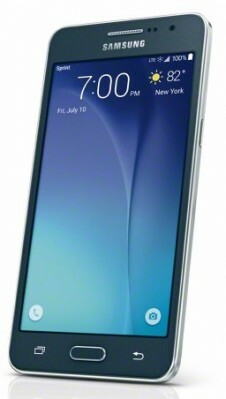 Sprint today announced that it will begin selling the Samsung Galaxy Grand Prime on July 10. The phone has a 5-inch qHD display, 1.2GHz quad-core processor, 8-megapixel main camera, 5-megapixel front camera, and a 2,600mAh battery. The phone runs Android 5.1 Lollipop and is compatible with Sprint's LTE 4G network. Other radios include Bluetooth, GPS, and WiFi (with support for WiFi calling). Sprint said the phone will be available through its retail stores, web site, and telesales. The phone will cost $10 per month for 24 months with no money down; $30 (after $50 rebate) with a two-year contract; or for the full retail price of $240, sans contract. The Galaxy Grand Prime is already available from Cricket Wireless.